How to Adjust to Your New Budget. Adjusting to a new budget (or any budget) is no easy task for anyone. Believe me, I know! Mari and I moved to Philadelphia in August 2015, a month after getting married. One of those events, moving or marriage, can strain any budget (even for a married couple of two financial advisors). So having both of those events in a one month period has drastically changed our “fun” budget. We moved from rural Pennsylvania (State College, Let’s go PSU!) to center city Philadelphia. We once were surrounded by cows, and now, we are surrounded by a concrete jungle. City living is amazing and it was something Mari and I had on our bucket list; however, it came with a new financial life. Three huge “budget” shocks were rent, car insurance and taxes! Yes, we still rent. We knew center city was not going to be our forever home so we didn’t want to buy something for a short period and then have to sell it. Plus, there many other reasons why renting made more sense at this time although we can save that for a later date. Shock 1: New rent is 200% higher than the rent of our last home. As you know, rent is already too expensive. Good-bye discretionary income (aka fun money). Car insurance is a necessity in life and you don’t really think about it all that much. Let me tell you when you start to think about it, when it increases by 200%! Shock 2: New car insurance also increased by 200%! We knew car insurance was going to be higher in Philadelphia but not that much! Last but not least, taxes. For the first time in our lives, we pay more in local taxes than we do in state taxes! Shock 3: The Pennsylvania state tax is at 3.07% and Philadelphia County comes in at 3.9102%. Another fun tidbit, there is also a 2% sales tax in Philadelphia, on top of the Pennsylvania 6% sales tax. This puts us at 8% sales tax, yay! So what does my rant lead to? Well, I am glad you asked. 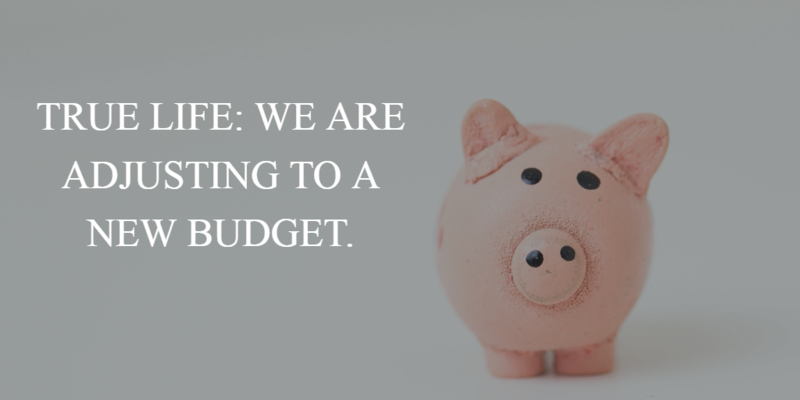 It leads to the fact that budgeting is important but I also wanted to show you that even a married financial advisor couple can get stressed with budget changes too. This step is vital because if you don’t track and review your budget each month, your chance of success greatly diminishes. Anyone can buy Quicken (PLENTY of great free options as well). We originally bought it to track our business expenses but have since mixed in our personal budget. WealthHarbor is a website for our WealthKeel clients; it is very similar to mint.com. Clients can link all their accounts, build a budget and track their spending. We use both sites, Quicken & WealthHarbor, to track our budget. You only need one good tracking system for your budget, and be true to it! Whether it’s our personal budget or the hundreds of clients’ budgets we have reviewed, food is always underestimated. Groceries and/or dining out are never close! I will provide some details on our budget to make this more appealing. Mari and I are firm believers in the Paleo diet, although we are not crossfitters, we do follow the Paleo diet rather closely. Here is the problem with Paleo, it is EXPENSIVE! If you’re not familiar with Paleo, here are the cliff notes: eat only meat/fish/chicken/vegetables, consume healthy fats and DON’T eat sugar, dairy or bread. Good news, vegetables are cheap. Bad news, proteins are not. Mari & I venture to Costco once per month to load up on proteins and veggies! Our monthly Costco budget is now $200 per month. For a period of our lives, which I am now ashamed of admitting, we would spend $500+ per month at Costco (the place is highly addictive, no matter how good your “shopping list” you buy WAY more than planned). In addition to the Costco budget, we allocate another $300 per month for groceries. Unfortunately, the nearest grocery store is WHOLE PAYCHECK (Oops, I mean Whole Foods) although right out our back door is the Italian Market. The Italian Market is America’s oldest outdoor market, and Mari is now best friends with most of the vendors. She buys a majority of our veggies from the vendors. Not only do they have great prices but they are also VERY hard workers and extremely nice people. Honestly, we usually go over the $500 per month for food but not by much and we get better each month. All things considered, two people on the Paleo diet for $500 per month is pretty darn good (in my opinion). Next budget breaker is going out for meals and/or drinks! Let me sum it up with this, don’t do it! I am just kidding, but seriously, try to limit it. Mari and I have tried our best here but it is difficult and leads to some tense times. When we lived in State College we had a lot of extra “fun money” and we could go out to eat and grab drinks without thinking twice (looking back, bad idea!). Not only do we live in one of the best food cities in the world but we also have amazing neighbors that we like to go out with. Good news, Philadelphia may be the BYOB capital of the world which helps on some costs. Bad news, Philadelphia may also be the brunch capital of the world which makes Saturdays and Sundays a constant food battle. Our goal budget is $100 per month but in reality that is one “date night” per month, which stinks, especially when you were used to a few per week! We have so many clients that assume we are budget “masters;” however, that is not the case. We struggle with the same budget items as you and have to use our own course corrections to get back on track. Our recent move to Philadelphia (right after marriage), was a large budget course correction for us. We are still not 100% on track yet but we are getting there. No budget will ever be perfect, although you don’t need “perfect.” You just need to make smart money decisions. Takeaway 1: Track your budget! Review your past months spending and plan your next month’s budget. Make adjustments where necessary. Takeaway 2: Keep a close eye on food expenses! Whether it is grocery shopping or dining out, make sure you track it closely. As noted, this is the biggest problem area for most budgets (including ours). Takeaway 3: The word “budget” is not a bad word; it is a really important word that scares many people. It scares them because they are terrified to face the facts. Numbers don’t lie (unless you are Enron or WorldCom). And remember...No budget needs to be perfect; you just need to make smart money decisions!